There is great potential for Renewable heating and cooling technologies to replace fossil fuels in Europe. Some key barriers, including a lack of a level playing field, unfair markets, and lack of information and understanding are holding back the deployment of these technologies. The FROnT project works on finding solutions to these problems. 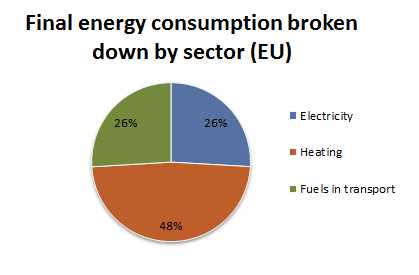 Heating and cooling accounts for around 50% of the final energy consumption in Europe. Most of this energy comes from burning fossil fuels such as gas and coal. 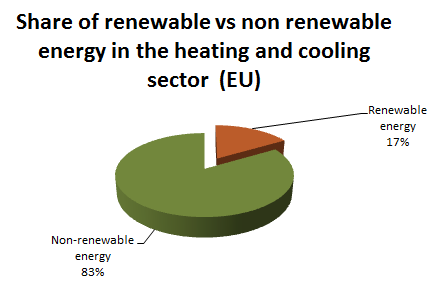 Renewable Heating and Cooling sources (Biomass, solar thermal and geothermal) account for about 14%, but according to the NREAPs (National Renewable Energy Action Plans) this figure should grow to 22% by 2020. Four pan-European organisations are working on the FROnT project, representing the Biomas (AEBIOM), Geothermal (EGEC), Solar Thermal (ESTIF) and Heat Pump (EHPA) industries. These trade associations provide a European perspective, helping to make sure a level playing field can be created across the Union and making sure that the project results are replicable and applicable to countries outside of the project consortium. More information about specific renewable heating and cooling technologies in Europe can be found on the websites of the respective European associations. Visit the partners page for more information.